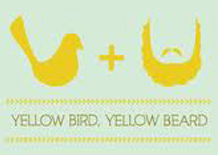 Happy Chinese New Year and welcome the Year of the Rabbit! 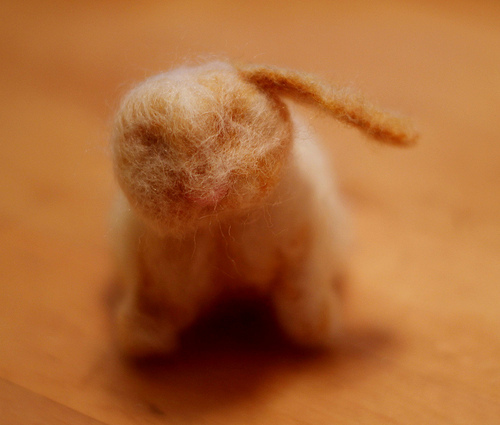 In honor of this cute and cuddly animal, I felted up a lop-eared bunny to celebrate, and snuggle up with. 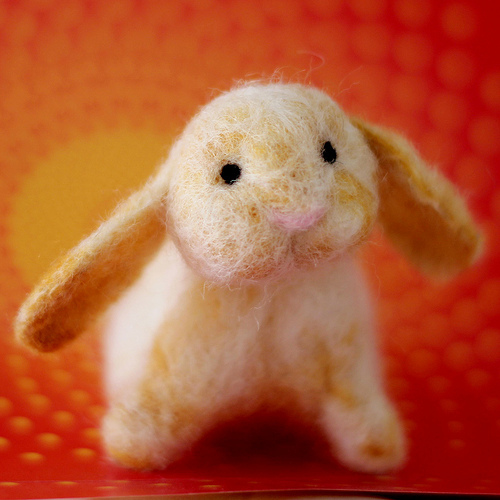 To make this sweet little bun, I started forming white wool roving into two balls, and gently worked brown threads into the white base for a mottled look. 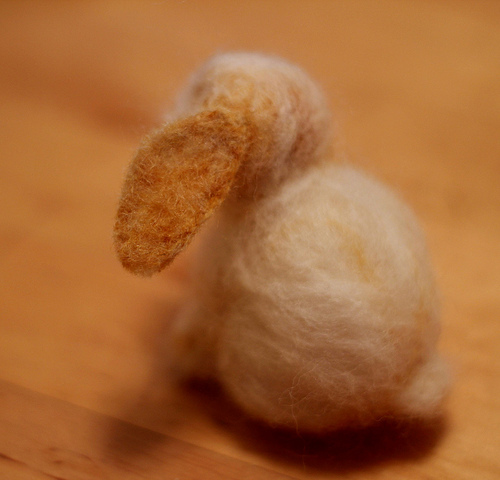 I pulled a tuft of all-white wool out of the larger ball and reserved it as the cotton tail. I then connected the smaller ball to the larger (creating a head and body) by working the needle up from the larger ball, into the smaller. I referenced several photos of rabbits while working on the body shape and positioning. I added two small ball of wool to create his front legs. This helped keep him upright as well! I made the ears by matting together the fibers into beaver-tail shapes, and as I attached them, I cupped them slightly, so that they would have more dimension. 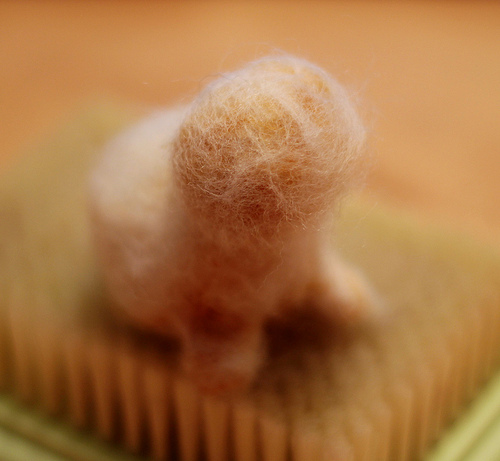 I added some pink fibers to the rabbit’s nose and black eyes, then did some finishing work to define his back legs. Once I was done shaping my “Year of the Rabbit” rabbit, I took him outside to smell the flowers! Then brought him in, to model for me in front of a festive red and yellow backdrop. I hope this year brings you all health, happiness and carrots. Happy Chinese New Year! This is sooooo adorable! My favorite of all the [incredibly cute] felt animals you’ve done so far. Thanks Catherine! 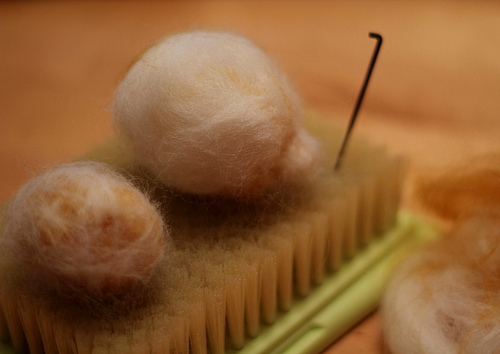 Have you ever tried needle-felting? I know you would be amazing at it!! This is lovely! Do you make these for sale? Thank you Anonymous! 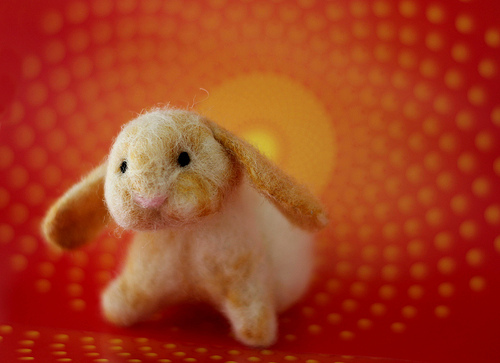 This bunny is already spoken for… but I am planning on making more soon. 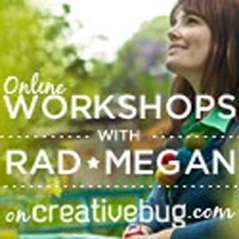 I’ll post an announcement on my blog when my store update is ready. Thank you for asking. And hello Ukraine by the way!!! Oh, my, goodness! So cute! I just bought the supplies so I can learn to needle felt, but haven’t taken the plunge yet. Thanks for the inspiration! This is sooooo cute! 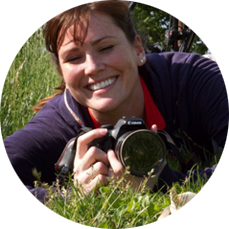 Thanks for your step by step pictures… one day I might just have a go! This makes me go SQUEE! Can’t wait to see your store in action! Staci you are welcome!! Let me know when you start felting! I’d love to see what you come up with! Trekky- thanks for the comment! Please do give it a go! Oh my… this little fella is so precious! Thank you so much for sharing the how- to. 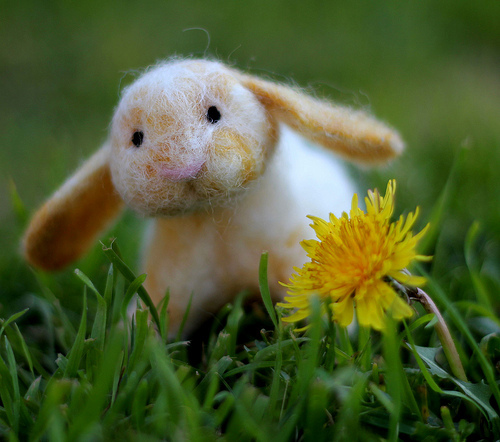 I will try out my brand- new needle- felting equipment tomorrow and hope to be able to give something as beautiful as little thumper here a try soon!